So often when something in our bodies feels tense or uncomfortable, our immediate response is to try to stretch, stretch, stretch the pain away. However, stretching alone often isn’t the solution. The yoga pose should be steady and comfortable. The delicate balance that Patanjali’s words evoke comes in handy when dealing with a common source of hip and knee pain: the IT band. The iliotibial (IT) band is a thick strip of dense, tough connective tissue, or fascia, that runs along the outside of the thigh. It arises out of the tendons of two of the hip abductor muscles on the outer hip: the tensor fasciae latae (TFL) and gluteus maximus. It then runs along the outside of the thigh, across the knee joint, and inserts on the outside of the shinbone (tibia). By connecting the muscles of the outer hip with the lower leg, the IT band stabilizes the hip and knee during activities like running, walking, and cycling. It also works in conjunction with its associated muscles—the hip abductors (gluteus maximus, medius, and minimus, and TFL) and quadriceps—to extend, abduct, and laterally rotate the hip. While IT band syndrome is a common overuse injury seen in runners, cyclists, hikers, walkers, and soccer, tennis, and basketball players, it sometimes affects non-athletes too. It usually manifests as inflammation or swelling on the outside of the knee and/or pain in the outer hip or knee. Many people think that a tight IT band is the cause of their pain. However, the issue is more likely a combination of weak outer hip muscles and tightness in the muscles that surround the IT band. The gluteus medius is one of the outer hip muscles responsible for hip abduction (i.e. lifting the leg out to the side, away from the midline of the body). When this muscle is weak (as it often is), the TFL is forced to pick up the slack and do its job. As a result, the TFL becomes overworked and tight. When the TFL is tight, it pulls on the IT band and creates excess tension. Tightness in the gluteus maximus stresses the band in the same way. Friction then builds up between the IT band and the muscles that lie beneath it (such as the quadriceps), and causes irritation and inflammation where the band attaches to the outside of the knee. The constant pull of tight hip muscles on the IT band affects the alignment of the knee and its ability to track properly. It’s a common misconception that we should respond to pain in the outer hips or knees by simply stretching the IT band. The fascia of which the IT band is made is not the same as muscle. Fascia is tough, strong, and relatively inelastic. By design, it does not respond to stretching in the same way that muscle does. Muscle tissues contract and expand and return to their original length after stretching. When fascia is stretched, it doesn’t bounce back. Once it’s stretched, it stays that way and can no longer perform its job of stabilization effectively. Instead of overstretching the IT band, we need to address the underlying weakness in the hip abductors and the tightness in the muscles that surround the IT band. The following sequence does both, aiming towards that elusive balance between flexibility and stability, sthira and sukha. 1. Lie on your back with knees bent, soles of feet on the floor. Draw your right knee towards your chest, flex the foot, and loop a strap around the ball of the foot. 2. Holding onto one end of the strap in each hand, stretch your right leg towards the sky. Either keep the left leg bent or straighten it, flexing the foot and grounding down through the back of the leg. 3. Release the backs of your shoulders down toward the mat, so your chest feels spacious and your neck muscles relax. Notice if one side of your sacrum is pressing down more than the other. If so, spread your weight evenly through the right and left halves of the back of your pelvis. Stay for 5-10 breaths. 4. Take both sides of the strap into your left hand and release your right arm to the floor to your right. Anchor your right hip to the floor and commit to keeping that hip down as your right leg travels across your body to the left. Only take the leg as far over as you can keep your right hip down and maintain that sense of even weight pressing down through both sides of the back of the pelvis. 5. Stay for 5-10 breaths. 6. Now allow your right hip to lift away from the floor and roll toward your outer left hip as you move your right leg farther across your body, pausing when the leg is parallel to the floor. Press the outside of your left leg into the ground. Activate your right leg and hip by pressing the ball of the foot into the strap, then drawing your outer right hip in the opposite direction. 7. Stay 5-10 breaths, then roll to your back, release your foot from the strap, and repeat on the other side. 1. Come onto your hands and knees, facing down towards the ground. If your knees are sensitive, place a blanket underneath them. 2. Step your right foot forward, aligning the ankle directly below the knee. Stack your hands on top of your right thigh. 3. Shift your weight back until your left hip is directly above your left knee. 4. Inhale as you sweep your left arm beside your left ear; exhale as you bend laterally to the right. 5. Stay 3-5 breaths. Inhale to come out of the side bend. 6. Bring your right knee back to the floor, then repeat on the other side. 1. Come onto your hands and knees, facing down. As before, if your knees are sensitive, place a blanket underneath them. 2. Step your right foot to the outside of your right hand and slide your left knee back so your weight is resting on the top of the thigh rather than the kneecap. 3. Draw your pelvis forward to open the muscles along the front of your left hip (the hip flexors). If it’s difficult to keep your hands on the floor, place blocks underneath them. 4. With your left hand on the floor or a block, bring your right hand on top of your right thigh and turn to look over your right shoulder towards your left foot behind you. You might already feel an intense stretch along the left quadriceps on the front of the thigh. 5. If you’d like a deeper stretch, bend your left knee and hold onto the outside edge of your left foot with your right hand. 6. Continue to pull your left heel towards your left buttock. 7. Hold 5-10 breaths. Gently release your left foot back to the ground. Unwind, face forward, and come back to hands and knees to repeat on the other side. 1. Lie face down on the floor. If you feel discomfort in your hip points on the front of your pelvis, place a blanket under your lower abdomen. 2. Place one hand on top of the other and rest your forehead on your hands. 3. Place your legs about hip distance apart. 4. Press your pubic bone into the floor, elongate both legs behind you and float just the right leg up, keeping the big toe and the pinky toe the same distance from the floor. 5. While the right leg is elevated, inhale as you move it a few inches over to the right; exhale and move the leg back towards center. 6. Repeat 4-6 times, then lower the leg to the floor and relax before repeating to the other side. 1. Lie on your back with knees bent, soles of feet on the floor. 2. Draw your right knee towards your chest, flex the foot, and cross the ankle over your left thigh, just below the left knee. 3. Use your right palm to gently press your inner right thigh forward, moving your right knee farther from your right shoulder. 4. Lift your left foot and draw your left thigh towards your chest. 5. Reach your left hand over your right ankle and take hold of the outside of the ankle. 6. Keep holding on as you roll this whole shape over to the left, so you’re lying on your left side with the sole of your right foot on the ground, your left hand anchoring the right foot in place, your left leg relaxed on the floor, and your right knee pointing towards the sky. 7. Use your right hand as you did before. Gently press the inner right thigh forward away from you, then release your right arm over to the right and gaze up towards the ceiling. 8. Stay for 5-10 breaths. Roll onto your back and uncross your legs. Repeat on the other side. 1. Lie on your right side with your head propped on your right arm, hips stacked. Bend your knees 90 degrees and rest them on the floor directly in front of your hips. 2. Straighten your top leg (the left leg) and flex the foot. The leg and foot will be parallel to the floor. 3. Keeping your left foot parallel to the floor, lift the leg slightly, then lower it until the foot hovers just above the floor. Lift and lower 5-10 times. 4. Bend your left knee again and bring the leg to rest on the floor just in front of the right leg. 5. Bring your right hand to the outside of your left thigh, roll your upper back onto the floor, and stretch the left arm over to the left as you open into a twist. 6. Stay for 5-10 breaths. Roll onto your back and repeat on the other side. 1. Sit on the floor with both legs straight in front of you. 2. Bend your right knee and cross the right leg over the left, stacking your right knee directly above your left knee. 3. If this feels too intense or you’re unable to ground through your sitting bones with your spine tall and neutral, sit on a folded blanket or a block. You may stay here with the bottom leg straight or bend the bottom leg. 4. If both knees are bent, bring your feet close to your hips to lessen the intensity; for more intensity, move the feet farther from the hips. Work toward bringing your feet to approximately the same place on either side. 5. With your right leg on top, bring your right hand to the floor beside your right hip. Inhale as you sweep your left arm beside your left ear; exhale as you bend laterally to the right. 6. Press your left sitting bone into the ground and rotate the center of your chest towards the sky. Place your head wherever it feels comfortable for your neck. 7. Stay 6-8 breaths. Inhale to come out of the side bend. 8. Place your fingers on the floor just in front of your legs. 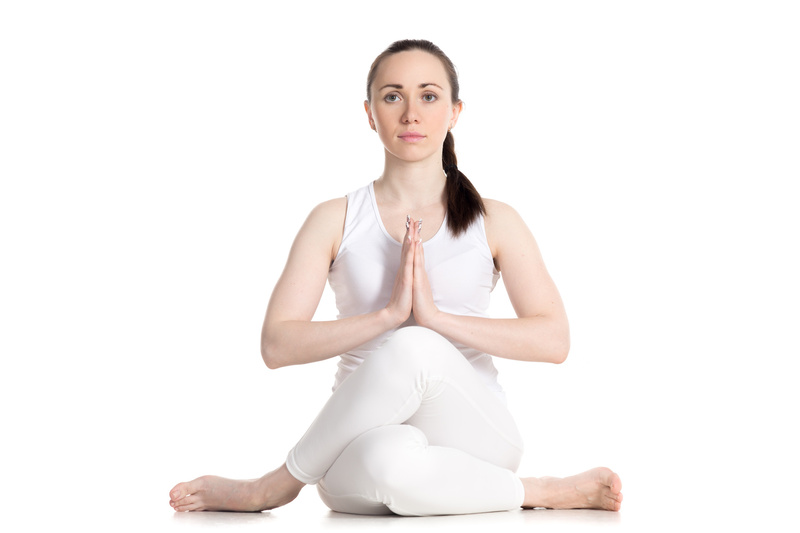 Inhale as you lengthen your spine; exhale as you slowly walk your hands forward to fold over your legs. 9. Stay 5-10 breaths, then inhale as you walk your hands back in towards your body and sit tall. Uncross your legs and repeat on the other side. Would you like to learn a relaxing core practice? Practice with Christine Malossi and YogaUOnline - Relax Your Core - 5 Poses for Psoas Release. 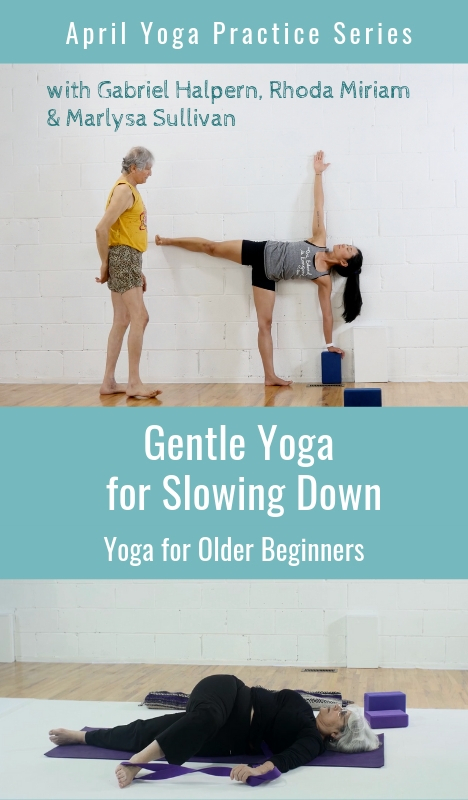 More yoga practice tips with a course brought to you by YogaUOnline and Donna Farhi - Anatomy of a Centered Body - Resolving Structural Imbalances in the Core Body-The Core Cylinder.